A version of this post was also published on Electronic Design. Have you ever needed to bias a low-current load and simply didn’t want to add another voltage regulator? Or been in a situation where you need a reasonable level of voltage accuracy, so a simple voltage divider isn’t enough? For many years, designers used Zener diodes as a simple shunt voltage regulator, as shown in Figure 1. With a single resistor, the device will maintain the fixed voltage determined during the manufacturing process. 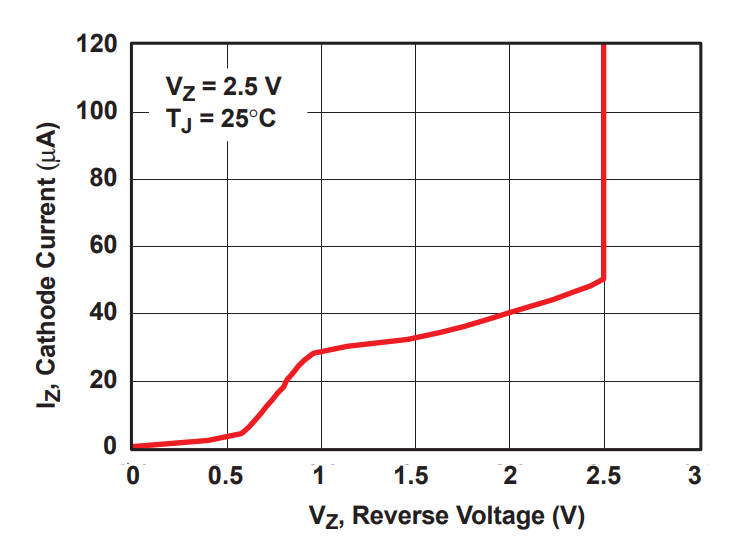 A good Zener diode works well, but when you look closely at the data sheet, you’ll see that you need to source more than a few milliamps in order to realize an accurate Zener voltage (Vz). To maintain accuracy, you must choose a low-enough series resistor value to ensure that the Zener reverse bias current (Iz) falls within an acceptable range. As shown in Figure 2, this range may be as high as 5mA, especially with lower-cost, non-temperature-compensated diodes. Ohm’s law and Joule’s law dictate the power losses across the shunt resistor, which affects overall system losses and temperatures. As an example, with a 12V input, using a 2.5V Zener diode would require a 1.9kΩ series resistor in order to maintain 5mA (assuming no load current). A 1.9kΩ resistor with 5mA results in a loss of over 47mW across the resistor. With 24V, the losses are over 100mW. A voltage reference (also called a band-gap reference) provides the same functionality as a Zener diode yet requires far less current to maintain a more accurate voltage. Where a Zener diode uses a single p-n junction with specific doping to create a Zener breakdown voltage, a voltage reference uses a combination of transistors and employs a positive-temperature-coefficient p-n junction in concert with negative-temperature-coefficient transistors to make a zero-temperature-coefficient reference. The concept and design of a band-gap reference was introduced back in the 1970s by Bob Widlar when he was a power integrated circuit (IC) designer. Although voltage references are often employed because of their voltage accuracy (well under 1%) over temperature and time, advances in semiconductor circuitry, processes and packaging have brought them into new applications. Wider-tolerance and lower-cost voltage references (1% and 2%) open up their use in applications where they were never before considered, applications where you might be using a Zener diode or voltage regulator. Using a voltage reference in place of a Zener diode is about efficiency and simplicity. 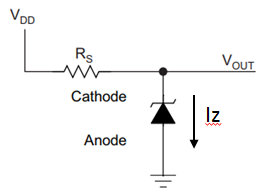 As shown in Figure 3, the voltage across the voltage reference becomes well regulated when Iz is only 50µA. Figure 3 shows characteristics of the Texas Instruments (TI) LM4040 at 25°C, yet the data sheet shows superb voltage accuracy when biasing well below 100µA over ambient temperatures from -40°C to +125°C (this is the extended Q-grade temperature version; the normal industrial temperature range is -40°C to +85°C). Some voltage references operate at an even lower current, such as the ATL431 and LM385. Using the same 12V example as above, with 75µA for Iz instead of 5mA, you can use a 126kΩ resistor and maintain a more accurate voltage. Using a 126kΩ resistor also enables you to realize a power loss in the resistor under 1mW, which is well below the 47mW loss when using a Zener diode. Of course, when delivering current to a load, you will need to select a lower-value resistor in order to deliver load current while maintaining the needed Iz for regulation over load variations. As shown in Figure 4, simply calculate the current through the shunt resistor (Rs) where Ir = Iz + Iload and then size the shunt resistor (Rs) using Ohm’s law, R = (Vs-Vz)/Ir. Be sure to use the worst-case load current and take tolerances into account when selecting this resistor. 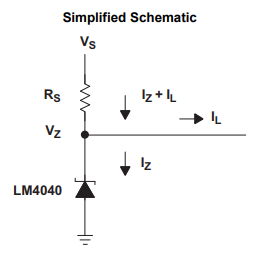 By using a wide-tolerance voltage reference like the 2% LM4040E from TI, you can realize a regulation voltage superior to most voltage regulators at a price lower than a typical voltage regulator and on par with a Zener diode. These devices are also available in small SC70 packages. An advantage of using a voltage reference for voltage-regulation applications is their ability to operate over very large voltage ranges; a voltage reference doesn’t care about voltage, only current. By choosing the right shunt resistor value based on the input voltage range and output current, you can support a very wide range with a simple solution. Figure 5 is an example of using the LM4040 to develop a low-current 5V rail from a 22-25V input to bias the 5V input to a USB controller IC, which only needs 100µA worst case. The resistor value selected takes into account additional bias current for a load not shown. This application can use the lower-cost 2% E version of the LM4040-N device. As you can see, the circuit is very simple and small when using 0402 passives. Because you need higher current, the shunt resistor will need to be larger in order to dissipate the thermal losses caused by the voltage drop. The maximum current through most voltage references is in the order of 10mA to 30mA, which limits applications. For higher current, you can employ the same voltage reference with a bias resistor along with an additional transistor to provide the necessary input-to-output voltage drop. A p-channel FET transistor biased directly from a voltage reference can supply much higher current, yet the output voltage (Vout) will vary with load current as a function of the FET’s RDS(on) characteristics. By adding an error amplifier (a single rail-to-rail operational amplifier works well), the circuit shown in Figure 6 senses Vout and compares it to the voltage reference to provide a well-regulated voltage over various changes in load current and temperature. Removing R2 (and shorting R1), the circuit shown in Figure 6 will provide a very well-regulated voltage equal to the voltage of the voltage reference. Voltage dividers R1 and R2 provide a means to adjust the output to any voltage greater than or equal to the reference voltage. 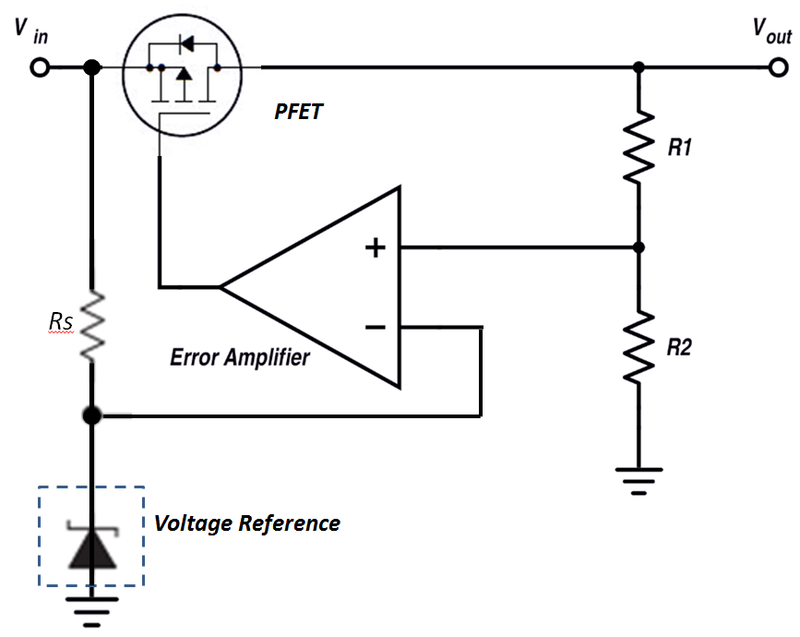 A voltage reference is at the heart of almost all integrated voltage regulators. You might ask, if it’s this easy, why use an integrated voltage regulator at all? One reason is that a voltage regulator also includes circuitry to monitor and limit current to the load, and monitors the temperature to protect the device and load during fault conditions. Although designers can and do design discrete voltage reference-based regulators, it’s often more practical and cost-effective to use one of the many integrated voltage regulators available today. So the next time you need a low-current rail voltage, consider using a voltage reference. Incidentally, significant technical advancements have also been made with both linear and switch mode voltage regulators. When trying to develop a low current voltage off of a 5V rail (or higher) Texas Instruments has recently released a broad family of cost optimized and small solution size linear regulators. The new TLV702 regulator seen in Figure 7, supports up to 5.5V input and offers a wide range of voltage options, a shutdown pin, and the family is available in very small packages. From a switch mode regulator standpoint, the industry has also seen significant advances in both low current as well as high current regulator solutions. Much advancement has taken place with self-contained switcher modules which include all of the necessary magnetics and are very handy for creating low voltage rails. These small modules also have the advantage of lower EMI than traditional discrete solutions, mostly based on lower impedance connections between the self-contained high speed switching nodes. Recently they have become very popular for local rail generation based on their ease of use and decreasing cost based on economy of scale. The TPS8208x buck regulator family is very small (3.0mm X 2.8mm) and produces tightly regulated voltages with output current up to 3A. For input voltages up to 36VDC, consider the LMZM23601. This small 3.8mm X 3.0mm module can produce low voltage rails with currents up to 1A and higher current versions are available. Choosing the best power regulation solution for a specific application always takes time and effort, and today more solutions than ever are available. Here we described some obvious and some not so obvious design options, each with specific subtle but often critical advantages that vary greatly depending on system application. Try out the voltage reference quick search tool. Save time during your search and analysis of regulator solutions with TI’s WEBENCH® Power Designer.